Emigrated, with his family, to Pittsburgh, Pennsylvania, USA in 1811. 1830 Census Tiffin, Adams Co., Ohio, USA. "On petition of William Adams & wife Elizabeth (formerly Elizabeth Mcdonnell), sister of John McDonnell, late of the City of Pittsburgh, decd., who died leaving a widow Sabina & no issue, but three sisters, to wit: Mary, wife of John Linton of the State of Ohio; Elizabeth, the petitioner; and Sarah (spinster), the last two residing in Co. Armagh, Ire. ; and seized of lot #251 in Pittsburgh, and a lot (held in common with James Ekin) in the Northern Liberties of Pittsburgh. The property was successfully partitioned into three portions. "To the ... Orphans Court in and for the County of Allegheny ... The petition of William Adams and Elizabeth his wife formerly Elizabeth McDonnell and Sarah McDonnell by James Stuart their Agent and Attorney by Warrant duly soustitated[?]. That John McDonnell late of the City of Pittsburgh in the County of Allegheny aforesaid, died intestate without issue living; and leaving at the time of his decease a widow named Sabina McDonnell or Sabina T. McDonnell and three sisters to wit Mary McDonnell, who is intermarried with John Sinton and resides in the state of Ohio; the said Elizabeth McDonnell intermarried with the said William Adams, and the said Sarah McDonnell spinster; the three latter residing in the County of Armagh, in that part of the United Kingdom of Great Brittain & Ireland called Ireland: That the said John McDonnell died seized in his demean as of fee of a certain lot or piece of ground situate in the aforesaid City of Pittsburgh, and marked in the general plan of said City (formerly Borough) No. 251 containing on Front or First Street sixty feet, and extending back to Second Street the same width or breadth bounded by First or Front Street aforesaid, and Second Street aforesaid, and by lots No. 250 and 252 ... [request to partition the property among the heirs] ... 9 July 1831"
Property in Pitt Twp held as tenant in common with James Ekin, dec'd. The headstone photograph comes from the Find A Grave website courtesy of Debbie J. 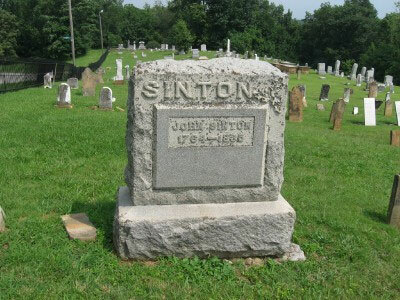 The location is the Village Cemetery, West Union, Adams County, Ohio, United States of America.